Let our excellent condition trailer be part of your outdoor travels this summer! 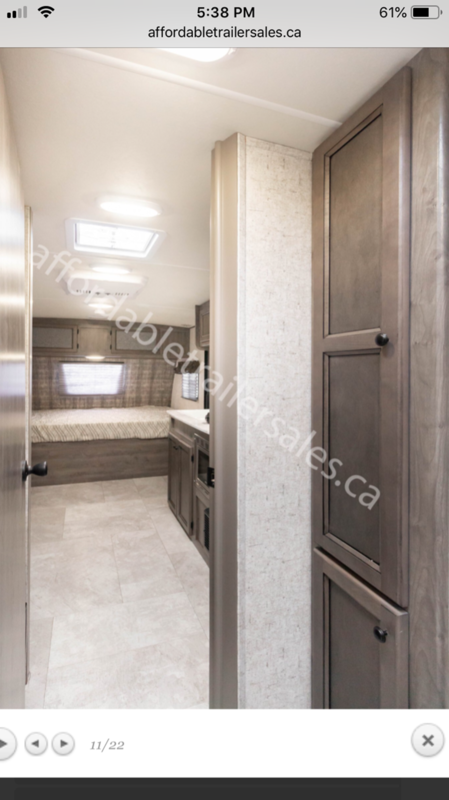 If you are looking for a unit with TV, wifi , satellite TV or Bluetooth then this trailer is not for you. However, if you want to go back to basics and enjoy your company and spend quality time with them, then this is the unit for you! Enjoy quiet time around the camp fire roasting marshmallows or cooking up some s’mores . Share and listen to camping stories or just enjoy looking at the stars on a clear summer night. Camping chairs will be included to enjoy both! Extend the motorized awning when it’s raining. 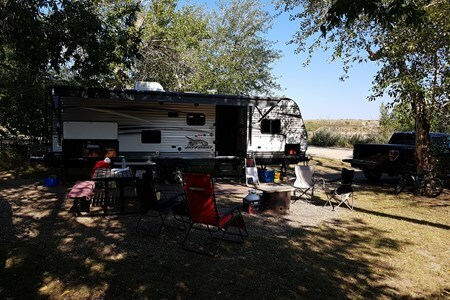 RV toilet paper, dishes, utensils, cooking pots and pans are all included, just bring your own bedding, pillows, blankets and beach towels and of course your food and other camping necessities. *No smoking of cigarettes, cannabis and vaping allowed and no pets please due to allergy to one of our family members. 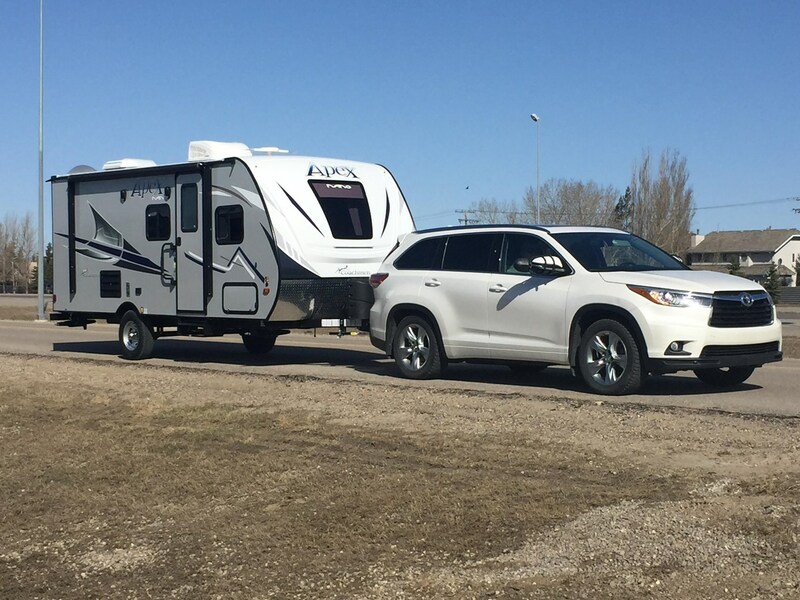 ** Our trailer requires a mandatory and working 7 pin connector to attach the trailer to your towing vehicle to operate all the safety features while being towed. Please ensure that your vehicle do have one. No 7 Pin connector no tow. A remote controlled electric tow brake control is available as an add on if your vehicle is not equipped with one. * Please check your vehicles towing capacity. 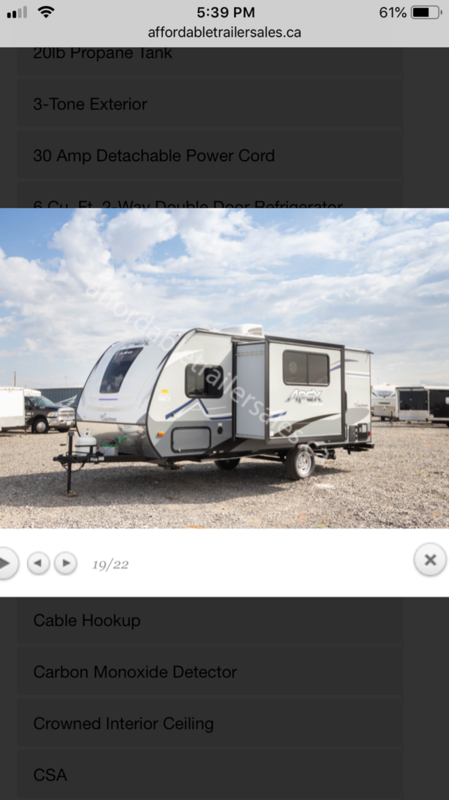 **Roadside assistance and insurance from Wheelestate is required to rent our trailer! Please make sure it is included at checkout. **Mandatory out of Canada Fee is required for wear and tear involving long distance driving. 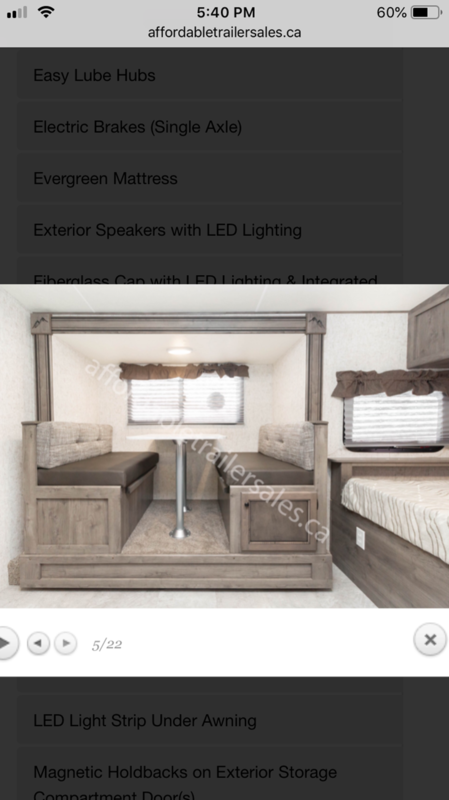 Please contact us if you are planning to rent our trailer out of Canada. An authorization will be required to cross the borders. 50 Remote controlled Electric Tow Brake Control.. Pls consult your towing vehicle if it has a factory or an aftermarket tow brake is installed. 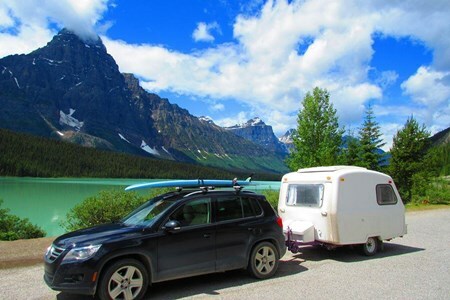 Please note that an electric tow brake is mandatory in Canada when towing a trailer. Pls contact us if you have anymore questions? 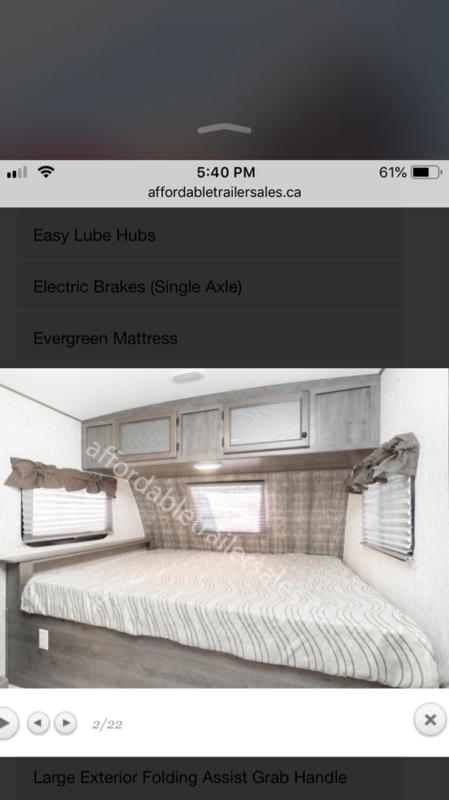 30 This is Mandatory fee if you are taking the trailer out of Canada for wear and tear associated with long distance driving . Please contact the owners . An authorization will be required to cross the US/Canada borders. Unfortunately not. One of our family members is allergic to animal dander. Please respect this and future renters. Does the fridge work on propane? Unfortunately not. 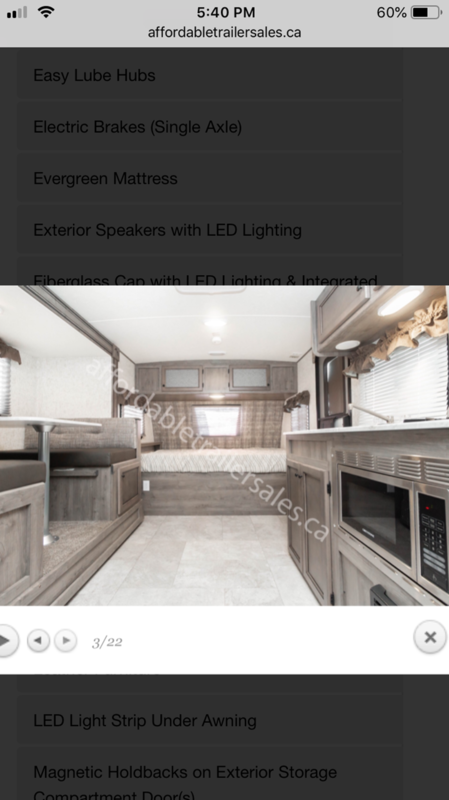 You will need at least a 15 Amp serviced campsite to run the A/C solely. 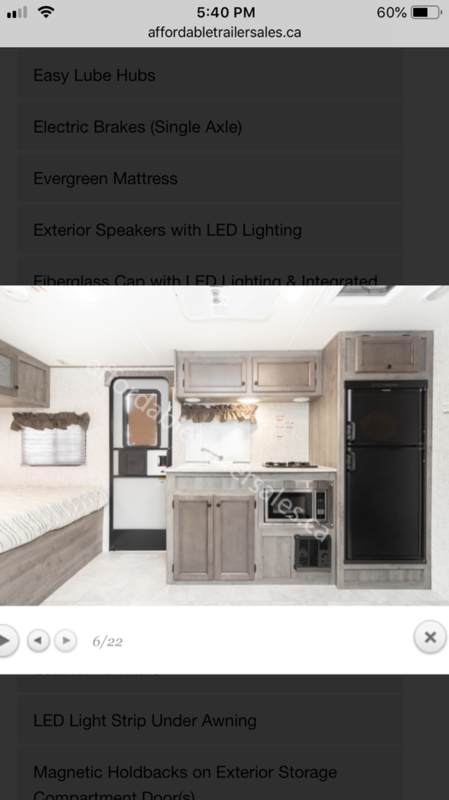 Sites that have 30 Amp power will run all of the appliances of the trailer. What can I ran on batteries? 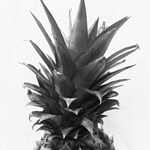 Can I put fresh water into the tank before I travel? 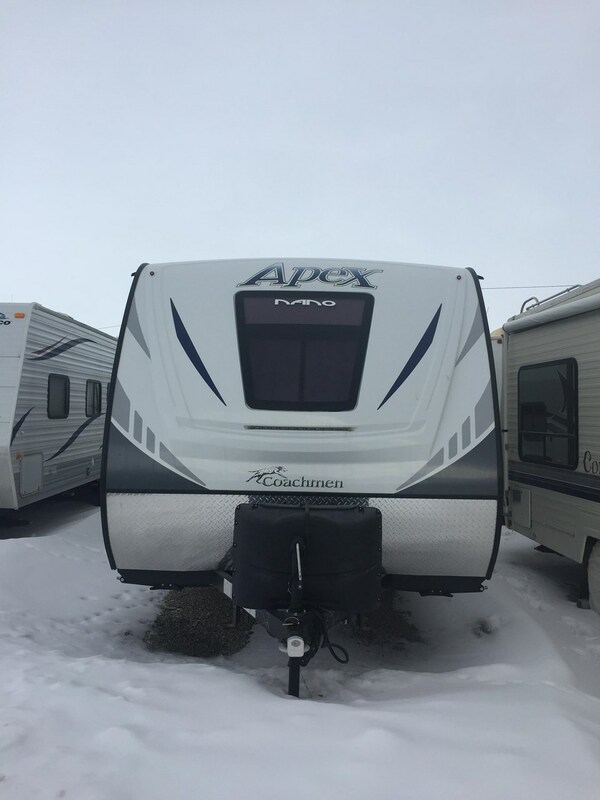 Yes you can but please be mindful of the capacity of the trailer to tow it safely.Also be mindful that loading the trailer with water will increase your gas mileage on your vehicle. Having a full tank will also affect your stopping time.safety first! What SUV will pull the trailer? Please consult your vehicle manual. We will not be responsible for damage to your vehicle due to improper towing and the trailer being too heavy for your vehicles towing capacity. 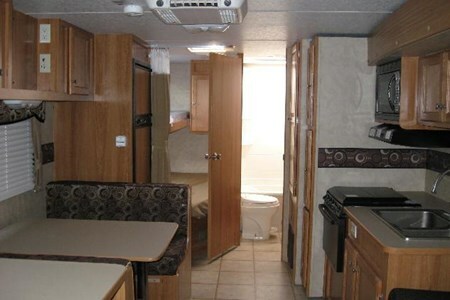 We will ensure that our trailer will be clean as well the items that’s included. 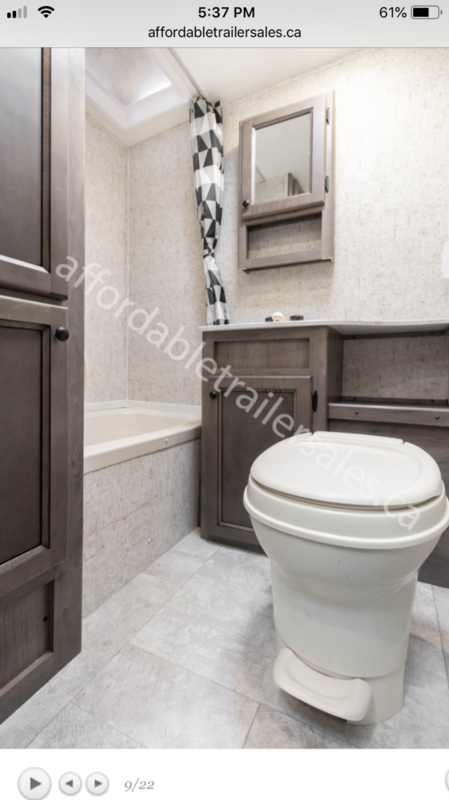 We expect that the trailer will be returned cleaned or $150 cleaning fee will be taken out off your security deposit to cover the time to clean the trailer. Is smoking cigarettes , cannabis or vaping allowed? Smoking of cigars, cigar, cannabis and vaping is NOT allowed inside the trailer. One of our family members has respiratory issues. Please be respectful to us and future guests. We will take off $500 off your security deposit to deodorize the trailer professionally. Do I need an electric tow brakes ? Is the towing hitch and sway bars included in the rental? Yes, the hitch receiver will fit into a 2 inch receiver attach to your vehicle. Our trailer is equipped with a superior quality sway bars and a towing hitch to tow the trailer safely. Safety pin is also included :) Safety first! Can I take the trailer out of Canada? Yes you can. 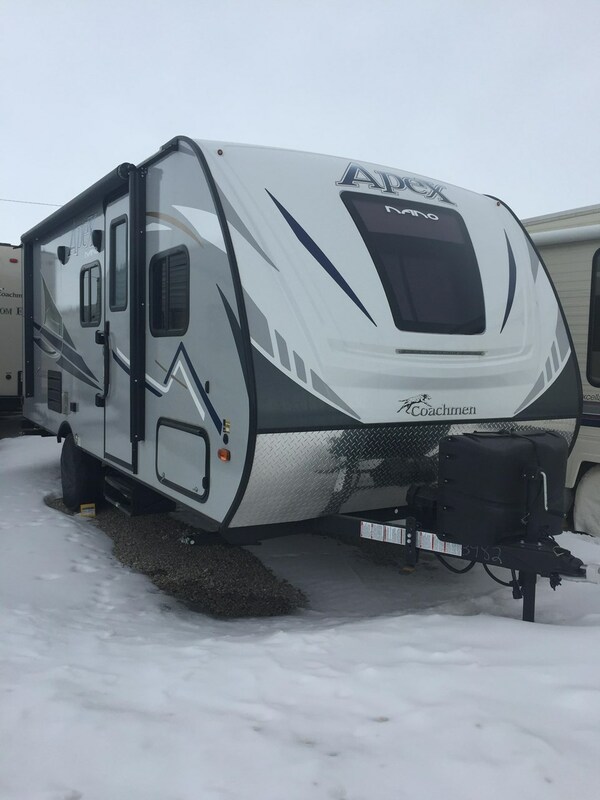 A mandatory fee is required to take the vehicle out of Canada to cover the wear and tear of long distance driving of the trailer. We just ask the renters to contact us if planning to take out out of the country. An authorization is required for the trailer to cross the borders legally. Do I need to buy insurance and roadside assistance from WheelEstate? 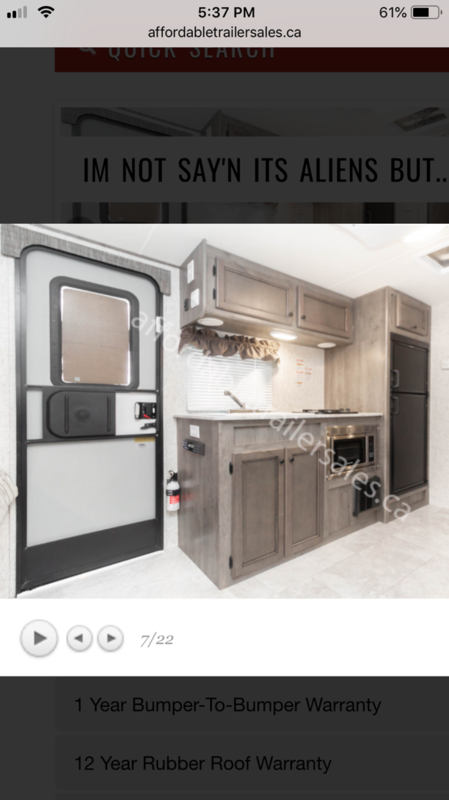 Yes we require both to rent our trailer. Our trailer is in excellent condition however with many moving parts, it may not be the case all the time. Insurance is for your piece of mind and ours :) Roadside assistance is available through Wheelestate if you don’t have a membership with AMA . Please note that towing a trailer costs up to $1000 and it will be the renters responsibility. Do I need a special towing mirrors? Safety is everything when towing a trailer. It is necessary that you can see both sides of trailer at all times when you are towing it. They are available at Canadian Tire. Is there a checklist available? A before and after towing checklist will be provided to ensure safe towing. Do I need to empty all the tanks before we return the trailer? Yes you do. We will expect that the fresh water tank will be empty. We also expect the gray and black tanks emptied and cleaned prior to returning. Cost to dump and clean the tanks will be taken out of your security deposit . You can empty out the tanks in most campsites . It’s also safer to tow a light than a heavy trailer. Again, think safer first! Why Do I need a 7 pin trailer harness? 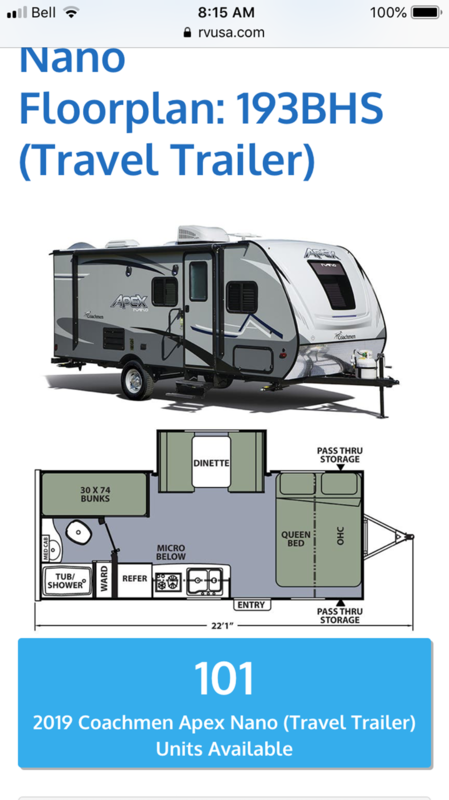 Our trailer requires a 7 pin wiring harness to operate all of the safety features of the trailer when being towed. Please also ensure that your 7 pin wiring harness is working. We will NOT let you take out our trailer without a working and property operational wiring harness. We would hate for you to lose your money over a defective equipment. SAFETY FIRST! Is the pick up and drop off time flexible? No. We have set the pick up and drop off time to be specific because we want you to know the trailer well before you head out. We also need ample amount of daylight to do the post trip walk through to ensure everything is in the same condition prior to your trip. Our storage facility also has a closing time .We will charge $50/hour from your security deposit if the drop off time is late. 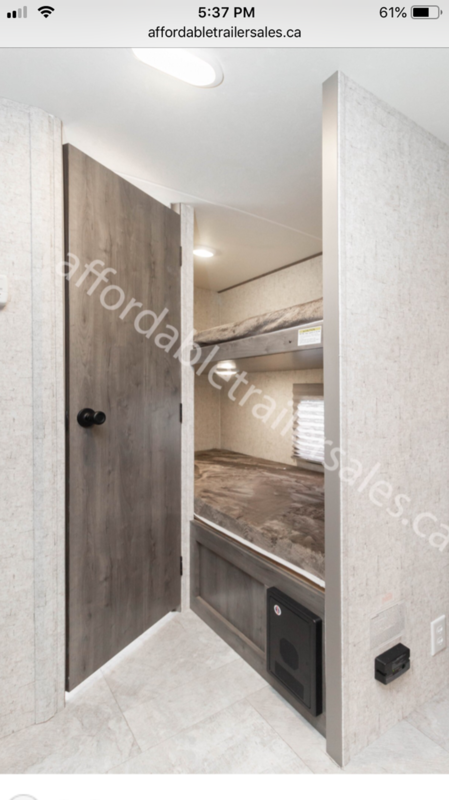 If you are unsure that you can drop off the trailer prior to the drop off time, we highly encourage to book another night and bring the trailer the next day for post trip inspection. The fridge, stove and the furnace runs on propane.